Cheerleading pom poms add pizzazz to a routine and can be used for showmanship. They are typically used for dance routines. In fact, as cheerleading became more athletic, pom poms gave rise to an entirely new genre of spirit leader: the pom girl. As cheerleading evolved from simply yelling with the all male teams of the late 1800s, to including more gymnastics and showmanship in the 1930s, so did the accessories that cheerleaders used. Lawrence "Herkie" Herkimer, who began the National Cheerleading Association, also holds the copyright to the first pom poms. However, the first usable cheerleading pom pom is generally credited to Jim Hazlewood. Pom poms were first used in the 1930s. However, they were made of crepe paper. As cheerleaders cheered, little strands of pom pom would fly everywhere. On top of that, the colors of crepe paper would run together if it rained or snowed. It wasn't until 1965 that a vinyl version of the pom pom was used. It was introduced to cheerleading squads across the nation by the International Cheerleading Foundation. The new vinyl pom poms were lighter in weight, and it was much easier to insert a baton or handle into the pom pom. 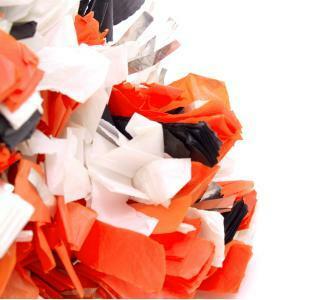 Cheerleading pom poms are now all made with vinyl material. This makes the possibilities of colors endless and squads can choose a variety of styles. It's even possible to have designs imprinted so that when the pom pom is in use you can see a bull's eye or other simple designs. There are a variety of pom poms that a squad can choose from. Every squad will want to own a set of cheerballs. They are smaller and a little less flashy, although you can get them in any color. They do not have handles either. They are less expensive and consequently many squads use them to practice, choosing to save the wear and tear on larger more expensive poms. Some squads also prefer to use them in routines that require tossing poms from one cheerleader to another. Since they don't have handles, they are not easily dropped. Finger poms or hand poms are cheerballs with a piece of elastic attached so that the cheerleading can attach the pom to her hand. These are good for dance routines since you cannot easily drop them. On the other hand, you don't want something attached to your hand if your routine has a lot of stunts. Rooter poms, as the name implies, are for rooting at the game. While cheerleaders certainly use them, they are also ideal for fans. They have longer pieces of vinyl attached to a handle. Because the strands are so long, they do not make for great showmanship in a routine. They are also not as full as a traditional pom pom. Traditional pom poms come in a variety of styles and colors. Many squads order two sets: one for cheering at games and one set for competition. Competition poms tend to come in metallic colors, but, of course, they don't have to be. You can also choose the width of your strands. There is not one width that is better than another; the length you choose should depend on your use of the pom. In general, the more dancing and stunts, the shorter and wider you want the pom to be. One of the more important factors in choosing a pom pom is the type of handle you'd like the squad to have. Some cheerleaders simply use the poms while doing traditional cheerleader arm movements. If this is the case, the traditional baton handle will suit the squad well. However, if your squad is dancing with poms, you might want to consider getting a bar handle that's easier to grip. It also comes with an elastic strap to keep the girls from dropping the poms while moving around. In order for your pom poms to last, you'll have to take good care of them. This includes fluffing them regularly and storing them properly. Grab small amounts of pom in your hand. With the other hand, gently pull strands down and away from you one at a time. Occasionally shake the pom pom, and this will also help separate the strands. Continue working with the pom until all the strands are separated and fluffed. If you don't want to fluff your pom poms every time you use them, you can store them so that they simply need a little shake every time you take them out. Long pom poms should be hung if possible. Hanging them up will prevent the strands from crinkling. If it's not possible to hang them, long pom poms should be laid carefully in a box. Think of them as if they were a fancy dress that you don't want to get wrinkled. After all, you can't iron your pom poms out! Short pom poms and cheer balls can be gently stored in a box since their short length will not let them hang properly. You will have to fluff them slightly every time you take them out. You can do this simply by shaking them and gently separating any strands as needed.